Custom imprinted 3.3.75 x 3.375 x 1.6875 adhesive note cubes 3 colors, 2 designs are great to make a big impression on all those potential customers, who can benefit your business. Personalized note cubes are one of those always-perfect promotional items, which never fail to serve the purpose. 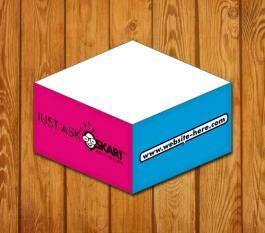 Most people happily receive customized adhesive note cubes because it offers them a reason to smile and stay organized. Cubed custom sticky notes find a place on worktable as a writing pad, paperweight, decorative item and more. Request a quote to know discounts that you can avail on bulk ordering these customized 3.3.75 x 3.375 x 1.6875 adhesive note cubes 3 colors, 2 designs. * Price includes 3 standard colors screen printed SPOT and 2 side designs. Product Size: 3375 in. x 3.375 in. x 1.6875 in.